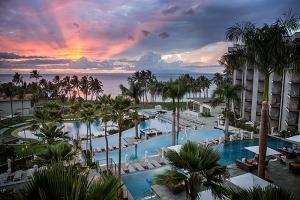 Andaz Maui at Wailea Resort is an experience unlike any other, redefining luxury with a non-traditional approach. This beachfront resort situated on Maui’s premier destination of Wailea on Mokapu Beach, is tailored for the discerning island traveler featuring guest rooms, suites and ocean front residential villas that captures the spirit and feel of today's modern day Hawai’i. Volcano Trips, Helicopter Tours, Hana Adventures, Sailing Trips, Wailea's Finest Luau, Hike Maui, Golf, Snorkeling, Scuba.